*these prices do not apply to New York City/Long Island deliveries. If you would like your structure delivered to NYC or Long Island, please contact us with your zip code for a custom quote. To get a specific shipping quote: Add the structure you want to your cart and click “Checkout”. In the space given, enter your zip code and click “Get Rates”. Select “Apply this Shipping Rate”, and the shipping will be updated to reflect the accurate price for the structure you have selected. 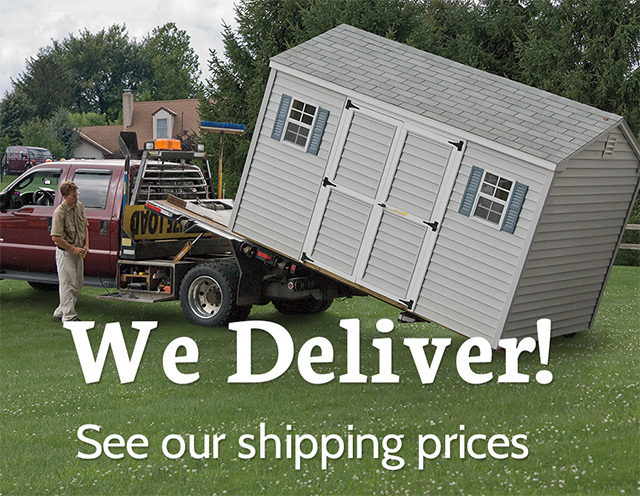 Delivery prices are calculated on mileage distance from our address in Bird-in-Hand, PA to your shipping address. Price shown includes unloading the item from the truck. Your delivery rate will be calculated and shown once you add an item to your order. We can unload the shed right on your foundation. There must be a clear path for us to deliver the shed to your foundation. Make sure no trees or overhangs will be in the way of a loaded delivery truck. We need at least a foot of clearance on either side of the structure for delivery; if the shed is going around any turns or angles, we will need more space. If you do not have access for a delivery truck, we can either use a shed dolly to move the shed into place or build the structure on site for 25% of the structure cost. Contact us for more information. We accept Visa, MasterCard and Discover credit cards on our website using secure and encrypted servers. On large structures like garages, sheds, and playhouses, we will charge your credit card 50% of the order total. Upon completion, the balance owed will be charged. Lawn Furniture will be charged the full amount when the order is placed. We can also accept checks or money order. We do offer site preparation for the foundation. However, cinderblock may be used for 6′ and 8′ wide storage sheds. Our site preps consist of a stone pad with laser leveling, 4×4 pressure treated timbers for a neat, straight border, 3-8 inches of 3/4 in. crushed stone leveled with the top of the border. The pad will be 12 inches wider and longer than the structure. The cost* is $5.00 per square ft; $395 is our minimum charge. This price includes up to 7 inches of the slope; if the slope is more than 7 inches, add $0.70 per sq. ft. (shed size) for each additional 3 1/2 inch drop. If you opt to do the site prep yourself, please make the pad 12 inches wider and longer than the structure itself. The pad must be perfectly level. We recommend using 3/4 in. clean, crushed stone for the gravel base.We can unload the shed right on your foundation. There must be a clear path for us to deliver the shed to your foundation. Make sure no trees or overhangs will be in the way of a loaded delivery truck. *prices apply within a 50-mile radius from our location. For site farther than 50 miles away, contact us for a custom quote. Sorry, there are no returns. We offer a 5-year limited warranty on all of our structures. The warranty is valid as long as the structure remains at the original address of delivery. If the owner moves during this five-year period, the warranty is voided unless the structure is moved by Amish Backyard Structures or authorized personnel. See our terms and conditions for the full warranty policy. Amish Backyard Structures is based in Lancaster, PA. We will only charge you sales tax if we are delivering in the state of Pennsylvania. PA Sales Tax is 6% of the order total. Any out of state deliveries, will not be charged PA Sales Tax. We at Amish Backyard Structures keep your personal information private and secure. When you make a purchase from our site, you provide your name, address, email address, credit card information and phone number. We use this information to process your orders, to keep you updated on your orders and to personalize your shopping experience. Customer information, whether public or private, will not be sold, exchanged, transferred, or given to any other company for any reason whatsoever, without the consent of the customer, other than for the express purpose of delivering the purchased product requested by the customer. Our secure servers protect your information using advanced encryption techniques and firewall technology. While all information and prices are deemed accurate, Amish Backyard Structures has the right to refuse or cancel any orders placed containing incorrect amounts due to typographical errors or incorrect prices. We are under no obligation to accept an order for which the price was posted incorrectly. Please note! The site must be accessible by our truck and trailer. We are going into your yard at your request. Therefore we do not accept any responsibility for damage which may occur if the yard is too soft. Average setup time is 1 hour. Price of shed does not include site improvements. Let us know if you prefer to use customer supplied block. Amish Backyard, employees, and contractors are not responsible for accidents or injuries that may occur while the swing set/playhouse is being used. Customer and his/her guest(s) use and operate the swing set/playhouse at their sole risk and assume all responsibility. Deposit is non-refundable 7 days after order. $30.00 return check fee. The customer is responsible for permits and boundary lines. This structure will remain the property of Amish Backyard Structures until paid in full. If the site is not accessible by our truck and trailer, a dolly fee of $80.00 will apply.